Implementation of classes for generic HTTP/LSL/REST handling. 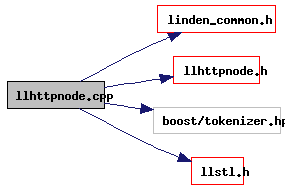 Definition at line 410 of file llhttpnode.cpp. Definition at line 315 of file llhttpnode.cpp. References LLHTTPNode::allNodePaths(), LLSD::append(), LLSD::beginArray(), end, LLSD::endArray(), and i.
Referenced by LLHTTPNode::getChild(), LLHTTPResponder::process_impl(), and LLHTTPNode::traverse(). Definition at line 412 of file llhttpnode.cpp. Referenced by LLHTTPRegistrar::buildAllServices(), and LLHTTPRegistrar::registerFactory(). Definition at line 468 of file llhttpnode.cpp.